This female garden holly evergreen has shiny, deep-green, pointed leaves and a dense globose growing habit. 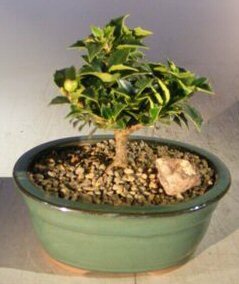 Since it matures to less than 1' tall, the Rock Garden Holly is ideal for Bonsai. Hardy, keep outdoors.